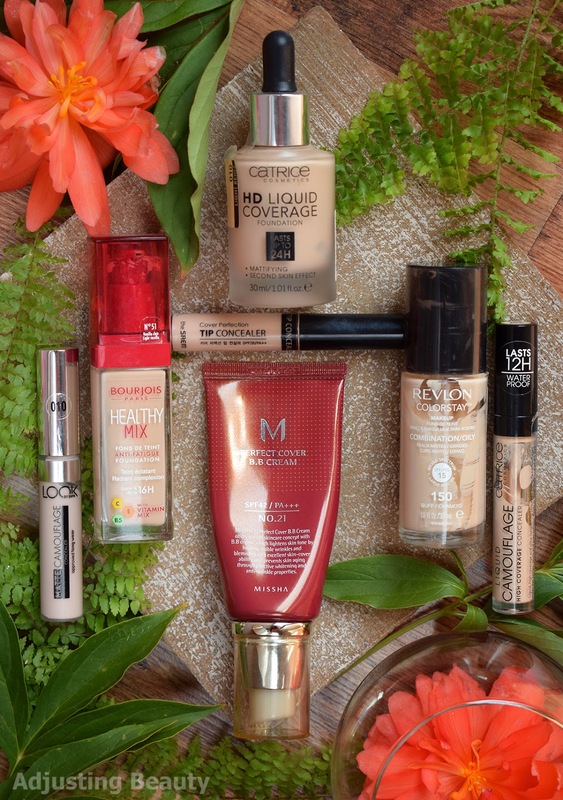 I got the idea to do these posts when one of my readers Sarah wrote to me and ask me, if I could do a round-ups of my favorites according to the type of product. I do monthly and yearly favorites, but in the wave of new products, I forget to talk about those staples that I actually love the most. In these posts I'll try to talk only about the products that are still available to buy, so there won't be any limited edition products here. I'm starting this series with the basic - foundations and concealers. 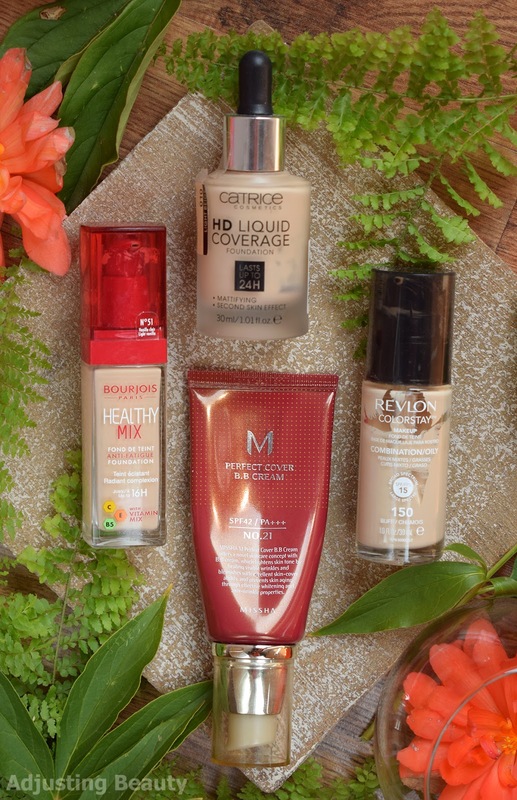 When it comes to foundations, I like a good coverage, although I also have some with lighter coverage for those good skin days. Semi matte finish is what I usually go for, but for winter I like something with a bit of sheen. I have about NC15 skin tone, when I'm not tanned and my skin type is combination and tends to get drier in the winter. When it comes to concealers I just love a good coverage as well, even more so than with foundations. Doe foot applicator is my favorite as well as liquid concealer formulas in general. This is actually a BB cream, but it has such good coverage that I just consider it to be foundation. It's my winter foundation and great for mixing with others to provide a more moisturizing and skin like finish. Korean BB cream have grey undertone to them, so keep that in mind, but it actually blends into my skin tone well. It looks almost neutral and my skin tone gets slightly more neutral in the winter time, otherwise I'm a warm olive undertone. It gives the most natural almost dewy kind of sheen to the skin and looks the most skin like out of all other foundations that I own. It's got the best of both worlds, skin care and coverage. Because even though it's a BB cream this has great medium coverage. I love tube packaging with the pump. I would recommend this to anyone that wants a bit of that natural sheen on the skin, good coverage, but still needs to look natural. It's not going to be for oily skin. I've already repurchased it a few times. You can get a full size or a mini travel size. I also use this more in the colder months, because of the formula, which is quite moisturizing and never emphasizes dry patches. 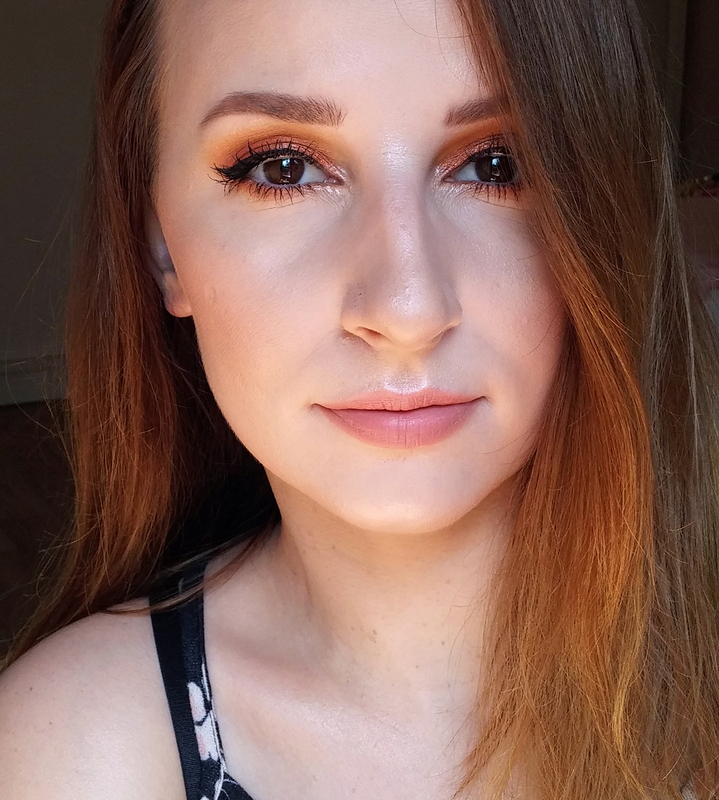 It's too dark for my usual skin tone, but it has very pronounced yellow undertone, so I love mixing it with other more neutral foundations to make them work for my skin tone. It's got natural dewy sheen, but this one doesn't have as much coverage as Missha. This is more for evening out skin tone and covering minor imperfections. If you have oily skin, you'll hate it and if you have dry skin, you'll love it. It's for those that want lighter coverage, warm undertone and foundation that doesn't stick to dry patches. I liked their older version more and I hate that the new one seem to be more orange toned as well as slightly darker, but I usually use it to mix with others, so I don't repurchase it that much. This is what I use in the summer time mostly, because I love the formula of it. It's liquid, dries down to a semi matte finish and gives nice medium coverage, but feels lightweight on the skin. I have the lightest shade which is again a bit too dark for me in the colder months, but I can wear it when I get a bit of color. It has somewhat of a more neutral grey tone to it, so I sometimes mix it with something more yellow. I think this is the best simple every day formula that most skin types would like. Great for combination skin, those that like a bit of coverage, but still prefer something more matte and lightweight on the skin. I've also repurchased this one, but not as much as others, because I mostly wear it just when I have a bit of color. Probably my holy grail foundation that I'm never out of. It's the best drugstore foundation I have found so far for giving you that almost completely full coverage, with a semi matte finish and gives you great staying power. The shade range is quite nice too. I use the second lightest shade, because it's the only drugstore foundation that leans a bit olive toned. It can be too dark for me for the winter though. This formula has been on the market for a long time and for a good reason. It's a bit thicker and more heavy feeling than for example Catrice HD. 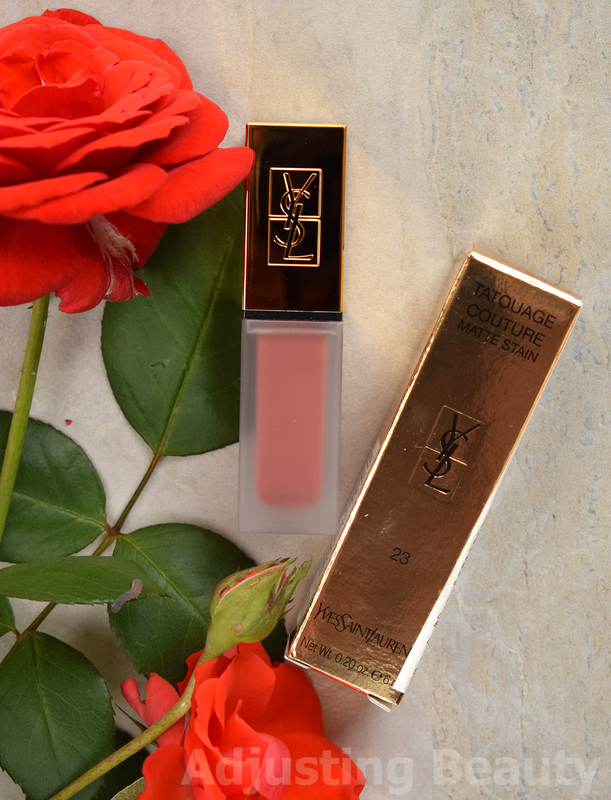 If you're looking for something more matte, with great coverage and that will las on your skin for the whole day, then you'll love this one. I only recommend the oily/combination formula, because I've never had the dry/normal version, so I can't say how that one performs. I've repurchased it multiple times and Revlon finally put pump on this glass packaging, so it's now perfect. It's more of a recent discovery, but has quickly become my holy grail concealer. It's another Korean brand, so the shade selection is very poor and unless you have light skin tone, I doubt you'll find the shade for you. That being said, the formula is amazing - thicker concealer with great full coverage. It still blends out well and doesn't look particularly cakey either. It fairly quickly dries down to a matte finish, but it's not drying, although I can't say how this would wear on dry skin, mine is combination. It also has great staying power. 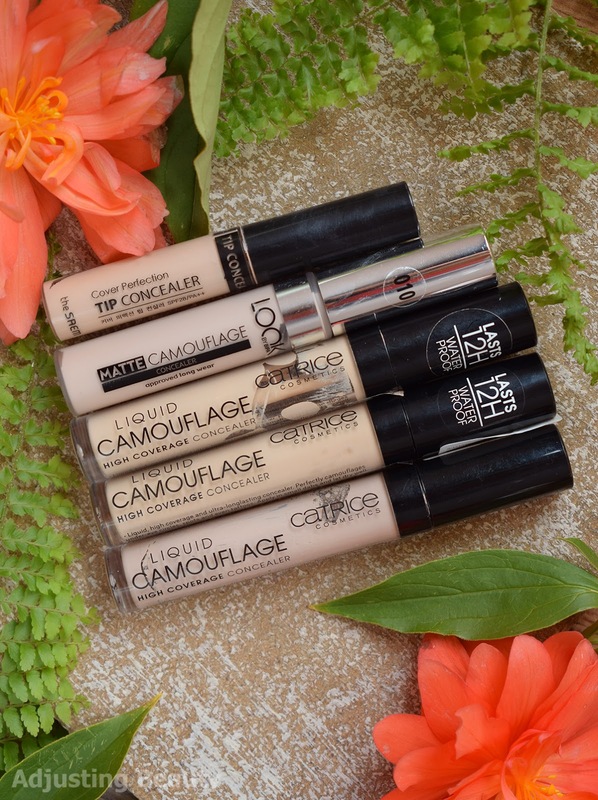 You'll like this one, if you're looking for light concealer shades and great coverage. This is another hidden drugstore gem that not a lot of you know about. Unfortunately, the shade range is again super poor, only two shades and they are both more on the light side. It's again a bit of a thicker concealer, but not as thick as The Saem and it has great coverage. You'll like this one, if you want something more neutral in shade. The Saem is definitely on the warmer side. I don't find it too look drying on the skin and the coverage is what sells me. It's also very affordable. This would be great for almost all skin tones, except for really dry skin. Think of it as just slightly less covering version of The Saem and it's not as matte looking either. A staple in my routine ever since it first came out and hopefully, Catrice is not stupid enough to discontinue it ever. I'm repeating myself here, but the color selection is poor and again geared toward light skin tones. 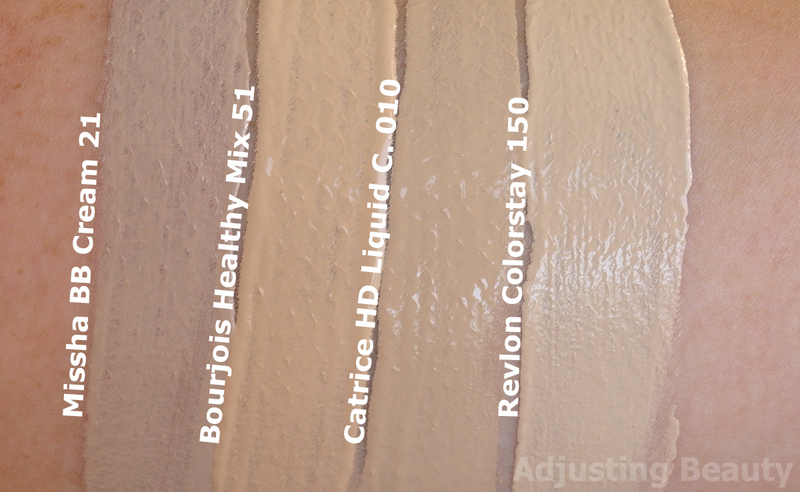 Catrice should really expend their shade range since I know this concealer is very popular. It's slightly lighter, but still somewhat medium coverage and the formula is definitely more liquid than both of the others I've mentioned before, but still creamy. I call this more of a moisturizing concealer, because I reach for it, if my under eye is dry or I have some drier parts on the skin. It still dries down semi matte, but definitely feels more lightweight and moisturizing. It's also great for those no makeup days when you just want to cover some minor imperfections. This one is my most moisturizing concealer and would therefore be good for most skin types. 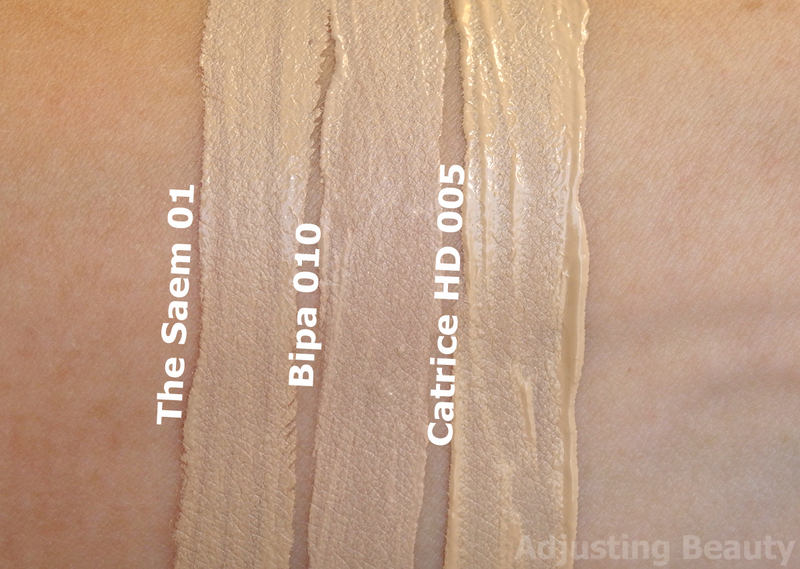 I use 005 Light Natural the most, but also have it in other shades for summer - 010 Porcellain and 020 Light Beige. Bourjois, Catrice in Revlon so na WL že nekaj časa, zaenkrat se najbolj nagibam k Catrice, sem videla, da ga je tudi Tati pohvalila :D Sem pa videla tudi pohvale za ta nov Insta Perfect od Essence, moram še premislit katerega vzet. Bipa korektor sem že parkrat zdaj testirala in sem ugotovila, da mi na obrazu malo oksidira (čeprav mi ponavadi korektorji oksidirajo samo na roki) tako da je odtenek na koncu kar pravi :D Mi pa je drugače všeč, tam-tam z Catrice in Essence. Catrice je meni prav taka super dnevna kombinacija. Mat, lahek in dobro prekriven. Tega ti zagotovo priporočam. Sem videla ja, da je bil Tati tudi všeč :D. Čeprav tega novega od Essence bi jaz tudi rada preizkusila. Slišim pa, da ni ravno mat, kar ne bo ravno super za mojo mastno t cono :D. Po mojem bi ti bil tudi Revlon všeč, če hočeš kaj bolj prekrivenga. Drugače pa zagotovo Catrice, če ne rabiš nekega coverage. Potem je tebi super, da ti malo oksidira, ker se mi zdita oba odtenka kar svetla. :D Jaz na sebi nisem opazila, da bi mi oksidiral. Ta nov od Essence je tudi dobro prekriven - mat verzija. Catricov je pa itak fajn. Jaz imam skoz kakšnega na zalogi, sploh za zimo :). Me veseli, da ti je všeč Bipin korektor. Jaz sem tudi navdušena, pa še poceni je, kar je vedno super :). Hvala :) <3 Meni bo pa tudi koristilo, da bom imela vse na enem mestu, ko me bo kdo vprašal za kakšne predloge :D.